Often best places lists reflect as much on what’s being measured, and who is being measured as on the inherent advantages of any locale. Some cities that have grown rapidly in jobs, for example, often do not do as well if the indicator has more to do with perceived “quality” of employment. Take places like Denver and Seattle. Both do well on what may be considered high-tech measurements – bandwidth, educated migration, entrepreneurial start ups – but have trailed other places in terms of creating jobs. 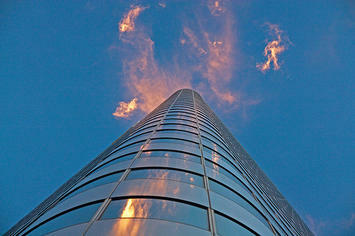 Others, such as Oklahoma City and Raleigh, do better in terms of overall job creation and cost competitiveness. There are effectively few truly objective criteria, and the Area Development list does tend to weigh a bit heavy on the factors that help more expensive – although not necessarily the most costly – cities. If cost of doing business, or regulatory environments were given more weight, some of the high fliers would not do as well. We prefer to focus less on atmospherics and more on how people, and businesses, are voting for their feet. San Francisco and New York have generally had slower job growth and greater outmigration, but do well on lists that focus on perceived qualitative factors. But then there is Austin. Here is one region that has it all, the low costs and favorable regulatory climate of Texas along with the amenities associated with a high-tech region. The area creates a large number of jobs of varying types and is still inexpensive enough to attract young, upwardly mobile families. This gives it a critical advantage over places like Silicon Valley, Los Angeles or New York. Unlike those three centers, Austin performs extraordinarily well in quantitative measurements. The region that most closely matches Austin in these respects is not Seattle and Denver, but Raleigh Durham. Recently a group of leaders from Raleigh made a visit to Denver to learn what makes that city successful. Speaking to the group, we pointed out that by objective measurement – job growth, educated migration, population growth – Raleigh beat Denver by a long shot, yet it was to Denver the group was looking for inspiration. 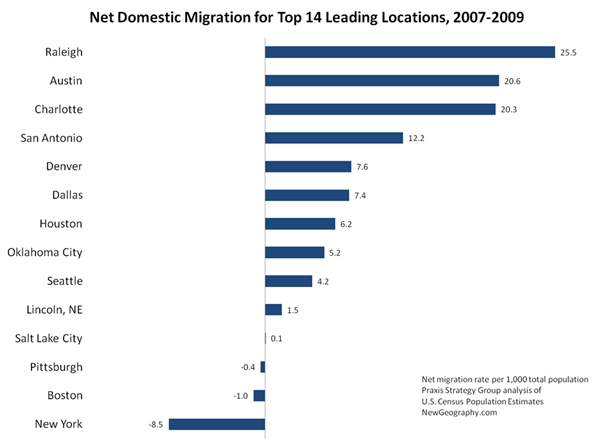 In fact, over the past three years, Americans have moved to Raleigh at a rate more than three times that of Denver. Perception can be a funny thing which makes a winner feel inferior to a clear runner-up. Another strange result is that New York and Houston had the same number of mentions. Yet looking at numbers --- from educated migration, job growth, population increase --- Houston slaughters New York. People, from the college educated on down are flocking to Houston while fleeing, in rather large numbers, from New York. One has to wonder where the rankers live and where they are coming from. Houston triumphs on performance, while New York, to a large extent, wins on perception. Looking simply at job growth over the past ten years for the Leading Locations mentioned on at least five surveys, the 14 regions separate themselves into three groups. The top tier of places – Austin, Raleigh, San Antonio, and Houston – all have seen job growth of more than 12% and seem to be recovering from the recession faster than the others. Salt Lake City and Charlotte were tracking with the top tier of places until 2007 but have since fallen to the second tier of cities. The remainder of the second tier includes steady growers Dallas and Lincoln, along with Oklahoma City, a region that has seen a boom in jobs since bottoming out in 2003. 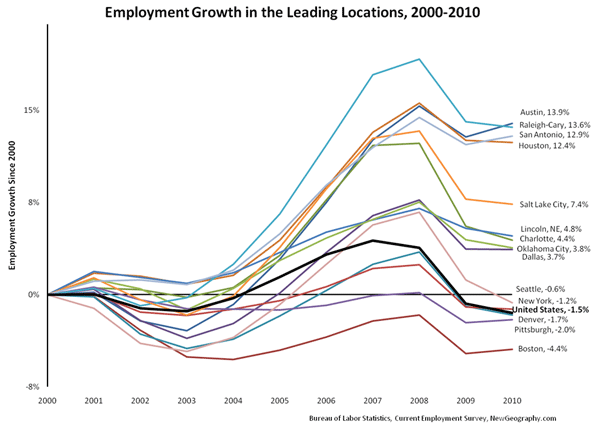 The final job growth tier of places includes five regions that have fewer jobs than ten years ago. Seattle drops just below the zero line after being hit particularly hard by the 2001 and 2008 recessions, while New York and Denver finish near the national rate. Pittsburgh and Boston spent most of the decade below their 2000 employment levels, but each seem to be recovering from the recession faster than many of the other Leading Locations cities. But perhaps the biggest problem with lists has to do with the size of regions. Much of the fastest growth in America, particularly in terms of jobs, has been in small metros, many with fewer than 1 million or 500,000 residents. Smaller dynamic areas such as Anchorage, Alaska; Bismarck, North Dakota; Dubuque, Iowa; or Elizabethtown, Kentucky – all in the top 25 of NewGeography’s Best Cities for Job Growth 2011 Rankings – are too small to show up on some lists yet may be a location of choice for expansion. This reflects not so much their relative desirability but the fact that, unlike larger regions, they simply are not included on many rankings. Ultimately, a list of lists does tell us much, but perhaps only so much for a specific individual or business. For someone interested in the movie business, for example, Los Angeles – and increasingly places like New Orleans or Albuquerque – are great draws, but perhaps not so much for financial services. The lists of lists are useful to identify hotspots, but for most location decisions, it may be more imperative to drill down to more detailed industry sectors and workforce attributes. And most of all, take the perception factor into account and look instead at the real numbers to tell you where to go. This piece first appeared at AreaDevelopment.com, as part of its Leading Locations series discussing best cities rankings. Joel Kotkin is a Distinguished Presidential Fellow in Urban Futures at Chapman University in California, an adjunct fellow with the London-based Legatum Institute, and the author of The Next Hundred Million: America in 2050. Mark Schill is Vice President of Research at Praxis Strategy Group, an economic research and community strategy firm. Both are editors at NewGeography.com, a provider of two surveys for Area Development’s Leading Locations list. Submitted by asustriksonwilliam on Tue, 04/02/2013 - 09:24. Submitted by sugarlander on Mon, 08/29/2011 - 13:42. "Another strange result is that New York and Houston had the same number of mentions. Yet looking at numbers --- from educated migration, job growth, population increase --- Houston slaughters New York. People, from the college educated on down are flocking to Houston while fleeing, in rather large numbers, from New York. One has to wonder where the rankers live and where they are coming from. Houston triumphs on performance, while New York, to a large extent, wins on perception." This is because the media has never been kind to Houston, and has greatly distorted the perception of it. The media generally looks down upon Houston and never reports on it unless it's something negative. I used to think this may be because it's in Texas (also generally disliked by the mainstream media) but that doesn't explain their love affair, to the point of exaggeration, with Austin. In fact, Austin is treated quite the opposite - its positives often exaggerated, and its negatives greatly downplayed or ignored. Most people who move to Houston are very pleasantly surprised, and find it is much nicer, more interesting, and more cosmopolitan than the perceptions that have been created by the media and others who aren't familiar with it.